Vintage Danesby Bourne Denby Vase in Pastels 9"
Slight marks/specks as pictured and a chip to rim. A RECTANGULAR LANGLEY'S DAFFODIL POT PLANTER. DECORATED WITH GOLDEN DAFFODIL'S. TWO FLAKES TAKEN OFF ON THE UNDERSIDE. SUITABLE POT FOR NEXT YEARS DAFFODIL'S. IT HAS AN IRREGULAR SHAPED BASE. There are identification marks to the base, 'Langley Ware' then '23' impressed along with other incised letters/numbers. make Supersized seem small. Large Parcel : not exceeding 2.5m length and 5m length and girth combined, the weight restriction in this category is 30kg and service provided by Parcelforce Worldwide (prices can be found on the link below). 15cm tall Beautiful and tactile No chips or breaks Some black dots - might be under the glaze and original, see pictures Do check out my other listings as I’m happy to combine p&p, thanks! It is decorated with flora and pendants in an Art Nouveau style on a high fired stonewear ground. VINTAGE BOURNE DENBY POTTERY PINK LAMB 5"
Here We have a Lovely little Stoneware Lamb by Bourne Denby fro. This floral hand-decorated pitcher is in excellent condition as it has been in a box in the attic. Bourne Denby Cloisonne pattern plates, sgraffito inscised with a cockerel. POSSIBLY A GLYN COLLEDGE PATTERN. 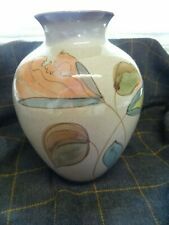 LARGE DENBY HAND PAINTED VASE. 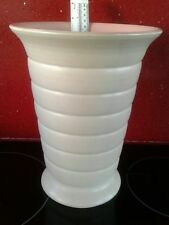 Elegant White Ribbed Vase by Bourne Denby Pottery. Vintage 1945-50 Stamp. Elegant Vase made by Bourne Denby Pottery. Simple off-white glazed vase. Small chip on base. LOVELY PAIR OF DENBY BOURNE RIBBED VASES. PINK 436 / 25. Three Cloisonne pattern small dishes 9.5cm widest with pair of larger dishes 12.5cm widest. Very nice Stoneware Lamb by Denby Bourne. Pale Turquoise Green. No 2 on base. A 1950’s piece of Bourne Denby by Glyn Colledge in the Cloisonné design - stunning jewel coloured glazes paints onto a matt grey glaze, with the Bourne Denby mark from c.1957 The dish measures 31 cm l h x 8 cm w and has a small painted over chip on the rim - hard to see. Thanks for looking and do check out my other items. Denby Danesby ware 1920s Electric Blue Trumpet Vase. in excellent condition for age, no chips or cracks see photos for siZe and condition Bourne Stoneware Large. Dispatched with Royal Mail 2nd Class. An early piece of Bourne Denby dating from the 1930’s and decorated in a pastel glaze with dripped paint design all over. The vase measures 17 cm h x 8 cm w at the top. The vase has a small chip on the base but no other damage. A great early example of Denby Pottery. Thanks for looking and do check out my other items. Stands at 14cm High x 13.2cm wide. Condition is very good, there seems to be a small area where the green has been touched up (see photo) and maybe a bit of restoration to the tip of one of the larger rabbits ears (see photo). Langley Ware - Soraya Vase. An early 1970s Langley Ware art pottery vase from the Soraya range designed by Glyn Colledge c1968. Hand painted decoration with stylised flowers and leaves below an ochre coloured neck. THIS UNUSUAL PIECE OF HARVEST WARE HAS THE TYPICAL GREYHOUND HANDLES FROM THE DENBY POTTERY ALTHOUGH THERE IS NO DENBY BACKSTAMP. THE LOVING CUP IS 5" ACROSS AND STANDS 5.25" HIGH. Tigo Ware Tisza syrup jug or vase c.1956. Designed by Tibor Reich. Vintage Bourne Denby Danesby Ware Decorative Bowl Danesby ware was manufactured from 1924 up until at least the second world war. This bowl has a relief pattern of yellow flowers and green leaves on an off-white background. Measures about 24.5 cm diameter by 8.5 cm high. Stamped with the DENBY mark on the base. 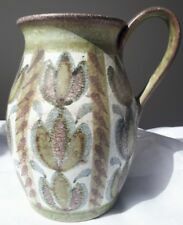 Denby Ware Arts And Crafts Bourne Pottery Vase.. Height measures 8inches In Excellent Condition. Dispatched with Royal Mail 2nd Class. Bourne Denby Danseby Marmaduke BUNNY RABBIT in Matte green. Condition is excellent. A lovely vase by Langley Pottery, Made in England. Textured outer with floral design. Makers mark to the base, also a faint mark 18/9, as photos. 10.5" LANGLEY VASE - ABSTRACT SWIRL PATTERN. A beautiful Denby studio pottery footed bowl / dish by Glyn Colledge. Hand painted in colours of orange, green, mint green, purple, burgundy and yellow. Decorated on the back with "comma" strokes. The Large Jug 8.25" has a hairline crack down one side. The Large Vase has been chipped and glued back in on the rim. Langley Mill Pottery. circa: 1950's. Textured Design. Factory mark to the base. We hope they satisfy you as to the detail and condition of the item for sale. Our Ref: 24318. Glyn Colledge Design. 'Glyn Ware'. Impressive looking Jug. circa: 1950's. We hope they satisfy you as to the detail and condition of the item for sale. Our Ref: 35718. Glyn Colledge Design. Langley Mill Pottery. Impressive looking vase. circa: 1960's. 10" (260 mm) tall. Factory mark to the base. We hope they satisfy you as to the detail and condition of the item for sale. Danesby Ware. a 1930s Danesby Ware Green Rabbit, in a Mottled Green colour. Condition in excellent condition with a glaze fault to one foot probably from manufacture. Glyn Colledge Design. 'Glyn Ware'. FOOTED DISH. Impressive looking Dish. circa: 1950's. We hope they satisfy you as to the detail and condition of the item for sale.